U.S. President George W. Bush said Sunday that Iran is threatening the security of the world, and that the United States and Arab allies must join together to confront the danger "before it's too late." Mr. Bush said Iran funds terrorist extremists, undermines peace in Lebanon, sends arms to the Taliban, seeks to intimidate its neighbors with alarming rhetoric, defies the United Nations and destabilizes the entire region by refusing to be open about its nuclear program. "Iran is the world's leading state sponsor of terror," Mr. Bush said in a speech he delivered about midway through his eight-day Mideast trip that began with a renewed push for an Israeli-Palestinian peace pact - an accord he said whose "time has come." Chiding U.S. allies who have withheld civil liberties, Mr. Bush said governments will never build trust by harassing or imprisoning candidates and protesters. But his rebuke was general, and he did not single out any U.S. partner in the region for oppressive practices. "You cannot expect people to believe in the promise of a better future when they are jailed for peacefully petitioning their government," Mr. Bush said. "And you cannot stand up a modern, confident nation when you do not allow people to voice their legitimate criticisms." "Iran's actions threaten the security of nations everywhere," Mr. Bush said. "So the United States is strengthening our long-standing security commitments with our friends in the Gulf, and rallying friends around the world to confront this danger before it is too late." Mr. Bush lauded democratic reforms in Gulf nations ruled by authoritarian leaders. He said the Iranian government in Tehran needs to make itself accountable to its people. And he called on the Palestinians to reject extremists, although he did not mention the Islamic radical group Hamas, which has gained control of the Gaza Strip. "This new era is being built with the understanding that power is a trust that must be exercised with the consent of the governed," Mr. Bush said. 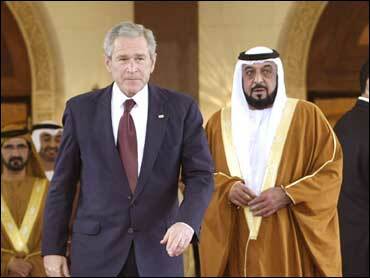 Mr. Bush spoke at the Emirates Palace, at an opulent, gold-trimmed hotel where a suite goes for $2,450 a night. Built at a cost of $3 billion, the hotel is a kilometer long from end to end and has a 1.3 kilometer white sand beach - every grain of it imported from Algeria, according to Steven Pike, a spokesman at the U.S. Embassy here. Half the audience was dressed in western attire and the other half in Arabic clothes - white robes and headdresses for men and black abayas, many with jeweled edges, for women. Mr. Bush said advancing democracy and freedom is the core of his administration's foreign policy and critical to U.S. security. "The United States has no desire for territory. We seek our shared security in your liberty. We believe that stability can only come through a free and just Middle East where the extremists are marginalized," the president said. He noted democratic reform in Iraq. "You have made your choice for democracy and have stood firm," Bush said, speaking to the Iraqi people. "The terrorists and extremists cannot prevail." Making an equally direct appeal to the Palestinians, Mr. Bush said "The dignity and sovereignty that is your right is within your grasp." In renewing his "Freedom Agenda" - Mr. Bush's grand ambition to seed democracy around the globe - he declared that "democracy is the only form of government that treats individuals with the dignity and equality that is their right." "We know from experience that democracy is the only system of government that yields lasting peace and stability," he added. Yet he was speaking about democracy in a deeply undemocratic country, the Emirates, where an elite of royal rulers makes virtually all the decisions. Large numbers of foreign resident workers have few legal or human rights, including no right to citizenship and no right to protest working conditions. Some human rights groups have accused the Emirates of tolerating virtual indentured servitude, where workers from poor countries like Sri Lanka are forced to work to pay off debts to employers, and have their passports seized so they can't leave. Officials in Abu Dhabi and the neighboring emirate of Dubai have said they are taking slow and gradual steps toward reform, both democratic and in labor rights. In the country's first-ever elections in late 2006, the government hand-picked a group of voters to cast ballots to choose members of a government advisory panel. But there is little clamor for elections in a wealthy country whose citizens are a privileged minority with access to free housing and lucrative government jobs. Many here say the galloping economy is evidence the government has done a good job.